Downhill with frozen waterfalls. Picture by Laura McDermott. 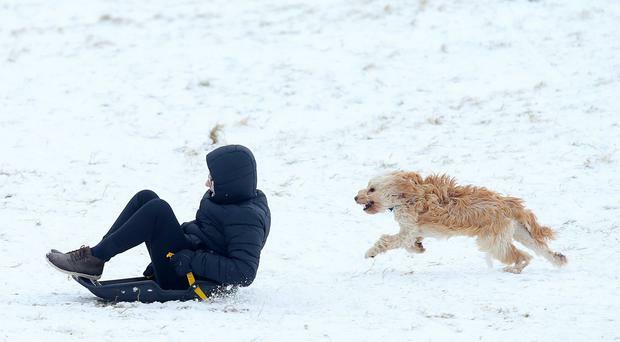 Schools closed and travel disruption amid heavy Northern Ireland snowfall. James Murphy pictured enjoying the snow at Stormont in Belfast. Picture By: Arthur Allison/ Pacemaker. A man is uninjured after slipping during the wintery weather in Belfast City Centre on Thursday. Road users have been advised to allow extra time for their journeys due to snow and ice. Picture By: Colm Lenaghan/Pacemaker. Battling threw the wintery weather in Belfast City Centre on Thursday. Further snow showers are expected, and is set to cause more disruption across Northern Ireland. Picture By: Colm Lenaghan/Pacemaker. Over 400 Northern Ireland schools have confirmed they are to close because of the adverse weather expected on Friday, March 2.